I got the disc, and I expected it to turn over with ease, and it wouldn’t. I would throw it back hand and it would never flip. It wasn’t “Drone” over-stable, but it was more stable than my buzzz’s, and this threw me for a loop. I remembered reading that it was supposed to be like a “seasoned Buzzz.” Where was the seasoning? Should I be adding salt and pepper? I searched on ebay for that particular stamp and run: none. I e-mailed the local seller in Arizona about the discs- he didn’t have any more. So there it was, I had a one of a kind disc that’s value was 100% personal. It wasn’t like people were filling up the disc golf forums with chatter of “EXTRA STABLE BUZZZ SS” midrange discs. I had come to grips with the fact that I couldn’t replace it, and I was “at peace with myself.” …or something. Until I perused the isle at Marshall Street Disc Golf shop… I noticed their factory second section had a stack of Buzzz SS’s… Cool. 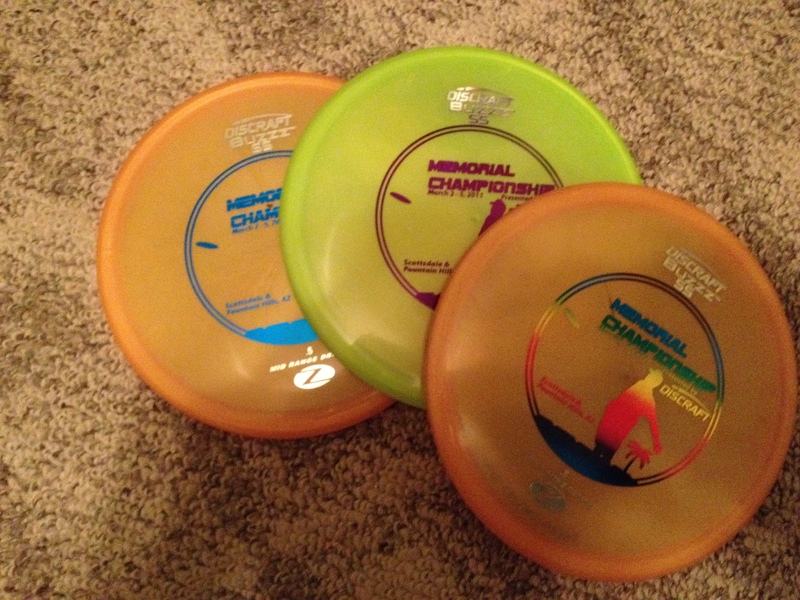 So I flipped through them; the same way you flip through records in a used-record shop, half expecting to find a super rare Lee Hazelwood album in there somewhere… but better than a Lee Hazelwood album, I saw two tournament stamped, 2011 Memorial Championships Buzzz SS discs. One of which was the same tangerine color, same weight, same domey top. I don’t know how it flies yet. I’m just an optimist at this point. If it turns out to be flippy, I’ll never admit it. If I admitted that, it’d nullify this whole romantic story of a boy and his stable Buzzz SS. It’s gotta be stable. It’s the same color. Same weight. Same stamp- has to be the same run. It was a factory second because of the stamp quality- which just made it cheaper for me in the long run. So I got a bargain, I bought it locally, I caught lightning in a bottle, and we all lived happily ever after! This entry was posted in Equipment and Gear and tagged buzzz, disc, discraft, golf, memorial, ss, tournament. Bookmark the permalink.